JD's second Yuneec Typhoon H hexacopter came with the ominidirectional "mushroom" antenna installed. This was a little range test flight to see how it fared against his first H with the more directional patch antenna. The patch antenna maintained the video link out to just over 2,200 feet. That video is here: https://youtu.be/QMlXkPkjBCA. The omni mushroom couldn't quite do as well. Of course, a subdivision is probably a pretty hostile WiFi environment, with lots of houses pumping out 5.8 GHz. Still, regardless of antenna, the H does better than JD's older Typhoon Q500 4K. This trip over the Shenandoah subdivision in Baton Rouge ("Red Stick") was pre-recorded. That is to say it was flown manually once to record several GPS waypoints to what Yuneec calls a "Curved Cable Cam" route. Then the route was played back in the controller so the Typhoon H drone would fly it autonomously. That left a joystick available for manual pan & tilt control of the camera during the flight. This separates the camera operation chores from the piloting chores. 4K video from the Yuneec CG03+ camera, edited, titled, musically scored, and rendered with Pinnacle Studio 20. It shows some of the snow from Baton Rouge's rare second snowfall of the season. Flown on 1/17/2018. Another trip over City Park Lake in Baton Rouge. 4K video from a Yuneec Typhoon H. Telemetry overlay courtesy of Dashware and Helmut Eisner's Q500Log2KML. Edited in Pinnacle Studio 20. Here's a 4K trip around JD's neighborhood in Baton Rouge, LA. It's shot from his Yuneec Typhoon H hexacopter. Telemetry overlay courtesy of Dashware 1.91 and Helmut Eisner's q500log2kml. Got a surprisingly decent 4K rendering from Pinnacle Studio 20 after adding titles and music. Now if only JD hadn't been flying like a drunken sailor. Fewer high-rate turns next time, please! This H is a lot snappier than his old Yuneec Typhoon 4K. JD takes his pet drone for a walk in front of the sidewalk on the other side of the street, leaving the drone to figure its own way around the light poles, trees, and bushes in its path. The drone watches JD as he walks down the opposite sidewalk, but you can watch the drones shadow and those of the obstacles to see what it does. It veers behind the first and third light poles, but climbs up and over the second. JD only touches the controls at the start, the turnaround, and the landing. The Yuneec Typhoon H does the rest on its own in its Watch Me mode with RealSense® obstacle avoidance switched on. A 4K video trip over JD's subdivision to the lake in Shenandoah with the new Typhoon H hexacopter. 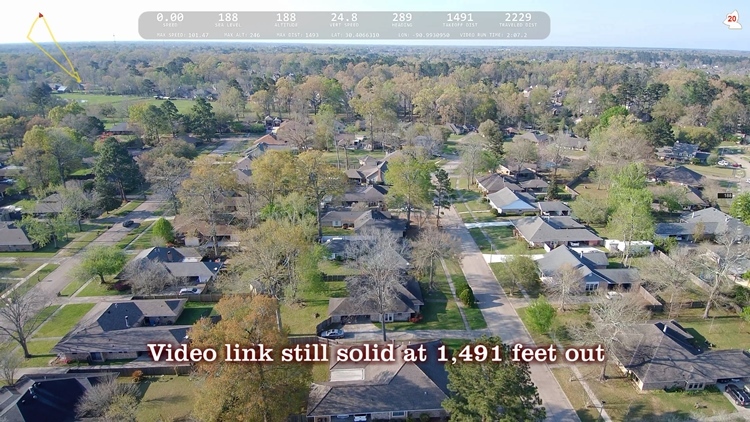 Almost a half-mile away (too far for the video link in his old Typhoon 4K quadcopter). Any further out, and the aircraft would be just too tough to see. Landscape looks a lot different on this 70° day compared to the snow-covered terrain of his trip not quite two weeks ago. That video is here as well, below. JD tries out his new Yuneec Typhoon H hexacopter with its RealSense® obstacle avoidance. It keeps the 4K video camera pointed at JD from ahead in Watch Me mode. All by itself, it navigates around a big tree which it senses and maps in 3D, remembering where it is for next time. JD will admit to being nervous as the drone approached the tree, but beeps and "radar bars" on the controller screen signaled it knew the tree was there and it altered its course safely around it autonomously. And with six rotors instead of four, and the ability to safely fly home with only five working, JD will be less nervous about his frequent flights over water. Baton Rouge got some rare Deep South snow on December 8, 2017. Once the visibility improved from the mile or so we had while snow was falling up to 9 miles, we launched the drone over the Shenandoah neighborhood to view the early White Christmas. No sound or titles on this raw, Yuneec Typhoon 4K video footage from takeoff to landing. A quick 4K video trip over the Old State Capitol in Baton Rouge, LA on November 26, 2017 with a Yuneec Typhoon 4K, edited in Pinnacle Studio 20. Another jaunt over City Park Lake in Baton Rouge, LA to see what the birds and waterfowl are up to. We go over the nesting tree for the egrets and pelicans, and behind the nice house with the red gables on the far side of the lake. Telemetry got a little sketchy, but we know the aircraft was over 1,200 feet away, and likely a few hundred feet more than that. 4K video from a Yuneec Typhoon 4K, edited in Pinnacle Studio 20.